The video game industry is one of the fastest growing in the world today. World of Warcraft, a multi-player, role-playing game, was the fastest selling computer game ever, across any genre, and sold 3.3 million copies in one day. Genese Davis is an author and video game promoter. Her debut novel offers a new, fresh perspective on a popular and constantly growing world. Kaylie Ames is struggling to keep her family somewhat sane after the sudden death of her father. Her mom’s absentmindedness has driven her brother to becoming a habitual runaway, and every time something goes wrong, it’s Kaylie who has to keep up the pieces–nevermind that she is attending college in a state thousands of miles away. So when Kaylie is introduced to the online multiplayer fantasy game Edannair, she relishes the chance to find an escape and challenge herself. Soon, Kaylie is moving up the ranks…and planning a takedown of the mysterious leader of her elite group, who calls himself the Holder. But the deeper within the game Kaylie gets, the more she struggles with her decision. Will she be able to do what she set out to without letting the game take her in completely? The description for this book seemed reminiscent of Ready Player One, which I absolutely loved, so I was definitely game (hehe) to give it a shot. Unfortunately the book suffered from a lack of action and a slow plot that weighed it down. I liked Kaylie well enough, and I really identified with her as I lost my father too. I felt so bad that she had to be the one who kept running to help her brother…as an older sibling, I also understood this. But I wish she would have told her mom, in a gentle way, that she needed to pull herself together and be there for her son. Kaylie is out of the house, and it’s not her responsibility to have to keep the family together. Luckily, Kaylie finds lots in Edannair to take her mind off of her real life problems. She actually learns about the Holder before she even begins playing the game. The Holder is the leader of a group called Sarkmarr, and likes to initiate his players by making them do humiliating missions. Kaylie won’t stand for this, and joins the game as a way to get back at him from the inside. A lot of the book’s chapters are detailed accounts of missions and raids Kaylie is a part of. I feel most of this could have been left out. There were also several characters introduced, and I found it difficult to keep track of who was who. Overall, I just kind of felt like some things were missing–I’m not sure exactly why, but the story didn’t feel whole to me. The ending of the book made it sound like this was the beginning of a series, and I would definitely be open to reading the next book. I’m a girl gamer, and novels such as this are a nice find for nerds like me. Genese Davis is an American author and video game promoter. 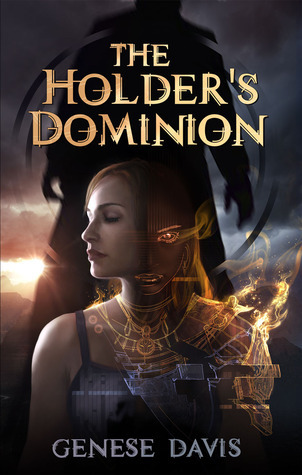 Her novel, The Holder’s Dominion, is available wherever books are sold. Davis is also the owner of The Gamer in You, an online movement offering new meaning to the word ‘gamer.’ As an avid supporter of artists and their craft, Davis has a keen affection for all types of artistry, especially theatre, filmmaking, music, photography, and art-gallery openings. She lives in Irvine, California, where she advocates for her other passion, animal rescue, and writes for independent film. Her motto is Lark your life! Posted on March 13, 2013, in books, reading, review. Bookmark the permalink. Leave a comment.